What a difference a year makes. At the end of the 2012 season, there were a lot of questions surrounding the Packers’ backfield. James Starks, who was a key part of the Packers’ 2010 Super Bowl run, was only able to start 2 games due to injuries, and always seemed to be battling some sort of nagging injury. 2011 3rd round pick Alex Green sustained a knee injury his rookie year and never regained the explosiveness he showed in college. The Packers signed veteran free agent Cedric Benson at the beginning of the season, but he was placed on injured reserve after 5 starts. Former Packer, Ryan Grant, who was coming off a brief stint with the Redskins was re-signed late in the season. 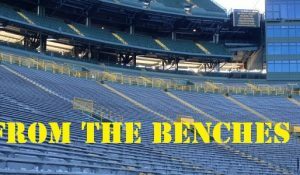 The only glimmer of hope was DuJuan Harris, an undersized running back who had been released by both the Steelers and Jaguars before being signed by the Packers mid-season. In short- The Packers’ running game was a mess. Fast forward just over a year later and The Packers now have an embarrassment of riches at running back. 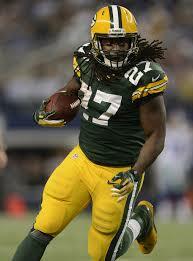 Last year’s 2nd round draft pick, Eddie Lacy, rushed for nearly 1,200 yards and 11 touchdowns on his way to winning the AP Offensive Rookie of the Year. James Starks was re-signed after averaging a career best 5.5 yards per carry last season, carving out a niche as a complimentary back to Lacy. Johnathan Franklin showed promise, running for 103 yards and 7.9 yards per carry in the one game where he saw the majority of carries. The 2013 4th round pick will be looking to bounce back after ending up on injured reserve due to a neck injury suffered late last season. And DuJuan Harris should also be back. The diminutive back that looked very impressive at the end of the 2012 season, missed all of 2013 after a sustaining knee injury. As expected, the Packers passed on selecting another running back in the draft this year, but they picked up a couple of very intriguing prospects after the draft, Mississippi State’s LaDarius Perkins and Tennesse’s Rajion Neal. Perkins is undersized at 5’7” and 197 pounds, but he ran a 4.4 40 at the combine and his ability to both catch the ball out of the backfield and return kicks are major pluses. The 5’11”, 220 pound Neal didn’t get a combine invite, but he ran for over 1,100 yards and 12 touchdowns for the Volunteers last season. And like Perkins, Neal has good hands, catching 46 passes and 4 touchdowns the past 2 seasons. The biggest issue facing the Packers won’t be finding someone to run the ball, but rather figuring out who to cut and who to keep. 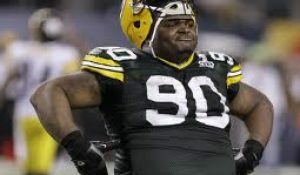 Lacy and Starks should be locks to make the roster. I don’t know that the Packers would give up on a 4th round pick like Franklin after one season, and before his injury, Mike McCarthy said Harris was the team’s starting running back. If you add in fullback John Kuhn, it looks like the Packers are likely devote 5 roster spots between running back and full back. After years of struggling to find any sort of stability in the running game, having this much talent in the backfield is a good problem to have. This entry was posted in Packers 2014 - 2015 Season and tagged Ladarius Perkins, Rajion Neal. Bookmark the permalink. This is a good problem to have. Lacy, Starks, Franklin, Kuhn make the team. It will be interesting to see what happens with both Harris and Franklin. 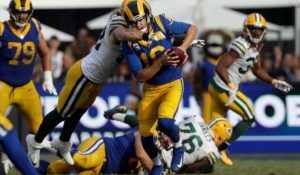 I like both of them, but you never know how bad Harris’ knee injury was, and I thought they originally they said Franklin’s injury was a concussion, but McCarthy recently referred to it as a neck injury.